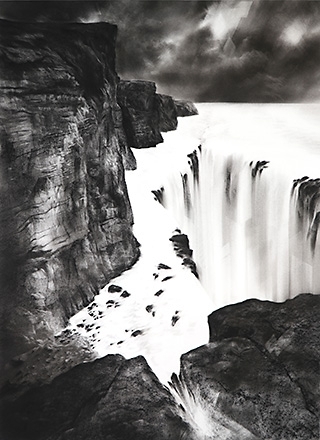 The PDX Art Program is honored to debut ten masterly charcoal drawings from the series A Storm Blown From Paradise by Vancouver BC based artist Amory Abbott. These superb works are on view pre-security through November 2019 in the International Arrivals area of North Baggage Claim. Amory Abbott’s art practice addresses a faltering ecological future by visualizing darkness and cataclysm in landscapes on the brink of transformation. Exploring conceptual commonalities between the charcoal medium, fantasy, and ecology, Abbott looks for inspirational sources in writing, storytelling, and music that regard the natural world as foreboding and somewhat sinister on the surface, but nevertheless seek spiritual communion with it. To that end, his work foreshadows a future that requires imagination and action, curiosity and magic, and spiritual introspection. By wandering through these solemn and chthonic environments, Abbott hopes viewers might experience awe, wonder, hope, and a tender appreciation for the land beneath our feet. A Storm Blown From Paradise is a series of charcoal works on paper developed by Abbott after attending a writing and arts residency on Sherkin Island, Co. Cork, Ireland in May 2018, designed to reconnect artists and writers with the land and its mythological and ecological histories. The works are depictions of real places, though shrouded in a fairy-tale darkness, imaginings of a world emptied of life, yet still very much alive. Amory Abbott was born and raised in Indiana and received his BFA in Illustration from Herron School of Art and Design in Indianapolis in 2004. After a decade of professional and personal art practice, he moved to Portland, Oregon to pursue graduate school, earning an MFA in Visual Studies at Pacific Northwest College of Art in 2016. He now lives in Vancouver, British Columbia and teaches illustration at Emily Carr University of Art + Design.